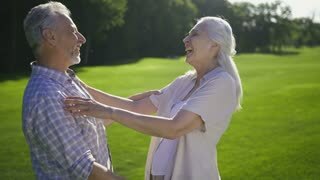 Portrait of attractive senior couple with gray hair laughing together on green lawn. Happy funny aged husband and wife enjoying outdoors and laughing out loud. Positive moment of retired seniors.